Clicking on the photos in this article will take you to their larger image. Among many other things at ATP; we have tried to introduce to our readership; the Railway heritage of Pakistan. 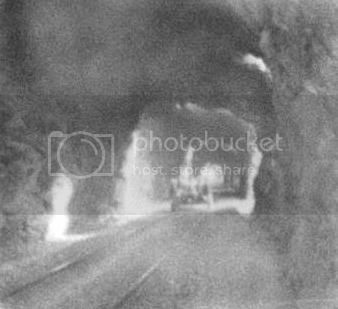 In the past we’ve had posts on Khyber Pass Railway, the Bolan Pass Railway and Khojak Tunnel. 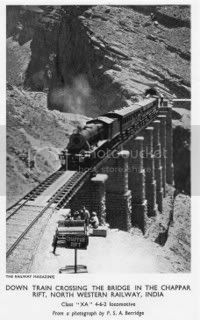 Today we will introduce yet another historic and scenic railway route which once existed in the Balochistan province and Chappar Rift was considered as its main attraction. 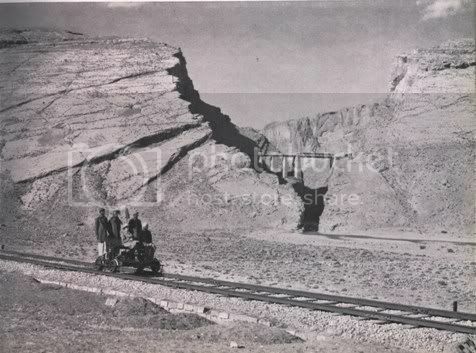 The first railway link to Quetta was inaugurated in 1886 via Bolan Pass. A year later another rail route to Quetta was opened via Harnai, Khost, Chappar Rift and Bostan. 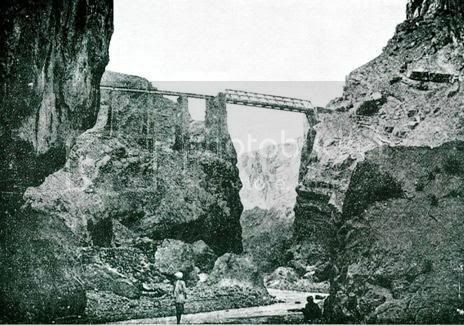 This route through Chappar Rift, though non-existent today, has been considered one of the most revered engineering projects in this part of the world. The map to the left gives the location of Chappar Rift. Many rail hobbyists around the world try to emulate the scenery of Chappar Rift in their models and many others still visit the area to see the remains of what was once a very scenic railway. 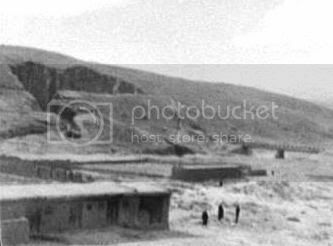 A retouched color replica of an original photo from Chappar Rift is given to the top right. An approaching train over a viaduct is visible. Can you spot couple of signalmen standing in the photo? This photo is orignally dated circa 1895. 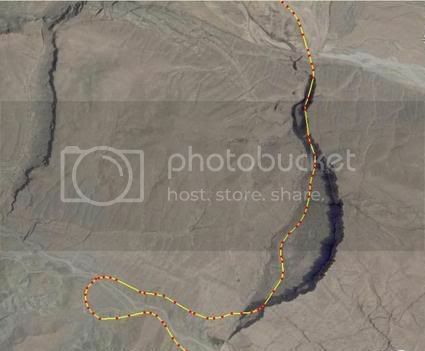 The ruling gradient of this track was 1 in 40 with a maximum altitude of about 6000 ft above seal level. What made the railway route through Chappar Rift an engineering marvel was the overcoming of two significant geological hurdles in the area. The first hurdle was an 8 kilometer long mud gorge made of gypsum clay. Since gypsum is not a hard material, laying rail track on this gypsum floor was a challenge. 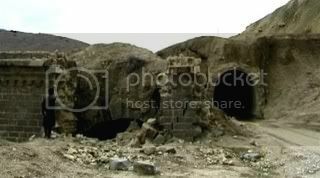 The photo to the left shows the south end of the mud gorge tunnel. 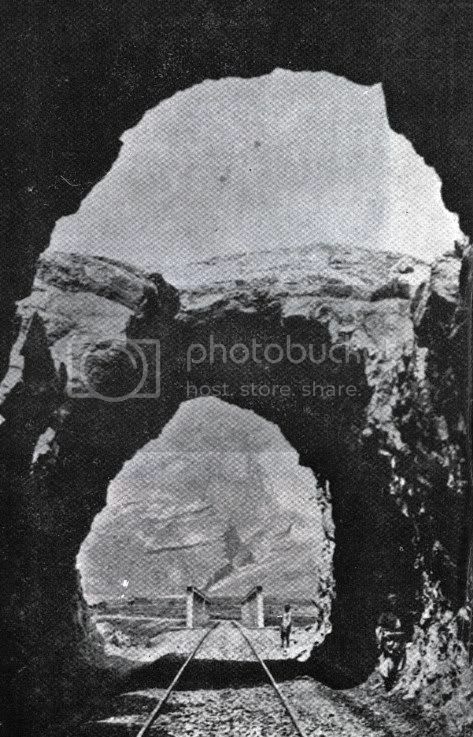 Due to partial liquefaction of the gypsum subsoil in wet conditions, the entire portal with approximately 50 ft of tunnel has floated off sideways by about 40 ft and sunk 20 ft into the ground. The second geological obstacle on this route was the Chappar Rift itself. 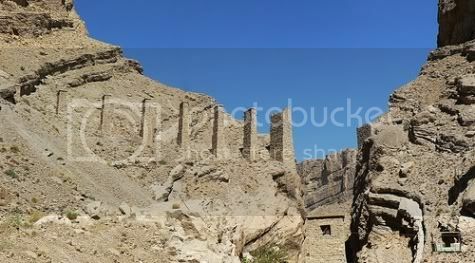 It is a 5 kilometer wide cleft with hills, as high as hundreds of feet on either side. Look at the photo to the right. It shows how two sides of the Chappar Rift were bridged. If you look carefully, you can spot an approaching train in the photo. Look just above the trussed bridge. The Railway line was laid negotiating and surmounting these natural hurdles. The salient features of the project included almost 2 km of tunneling, a seven span via duct and a 250 ft high bridge. In the photo to the left, this bridge and the viaduct are visible in center of the gorge. Chappar Rift is considered a freak of a nature. Look at the photo to the left. It shows Chappar Rift from the north. It was formed when a mountain split open in two parts after an earthquake in the area. The nature had carved these two parts so perfectly that from a distance the gorge appeared to be mating parts of a jig-saw puzzle. 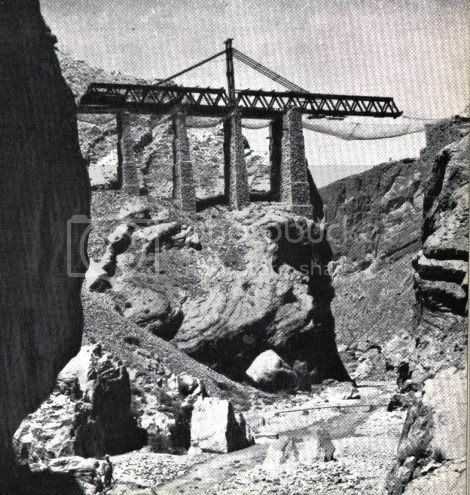 As the rail track entered Chappar Rift area it had no feasible foundation to be laid on the mountain edge. The rocks on the edges alongside the mountain were not considered practical. Engineers then decided to cut a line of continuous tunnels to make the rail bed more secure. See the photo to the right. 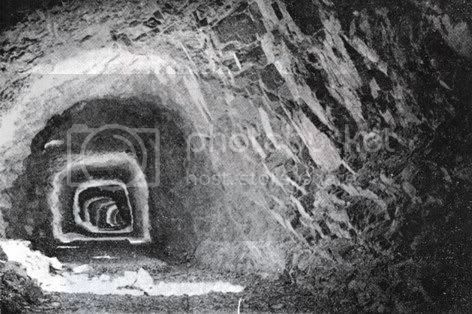 It shows how sequential tunneling was done in Chappar Rift to lay the railway line. 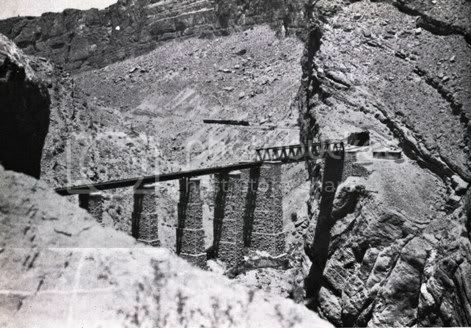 This type of continuous tunneling was planned for both sides of the Chappar Rift cliffs and track from both ends was to met in the center by an iron girder bridge. As normal convention of that time, if tunnel work was started from either side, it would have taken a long time and effort to finish the project. 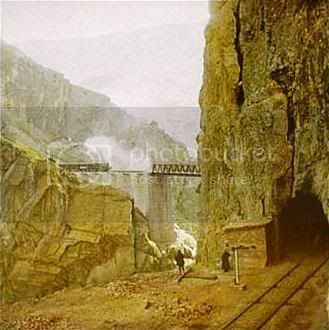 Therefore instead of constructing the tunnels in the usual way, the engineers adopted an expedient way of tunneling by driving openings (adits) in to the side of the cliff at various points, and then cutting the tunnel right and left of these openings until the various sections met. The photo to the left shows how this process was achieved. Also note a standing person in the photo to the left. Since mechanized elevators were not available, these openings were created by lowering men down by ropes several hundred feet from the top of the cliff until they reached the point where the work for an opening was to be started. The workers then drove crowbars into the perpendicular sides of the cliff in order to get the necessary support for a platform from which the blasting operations could be carried on. Six of these openings were made on one side of the cliff and six on the other. Altogether there is a collection of 1.95 km (6400 ft) of tunnels in the rift. 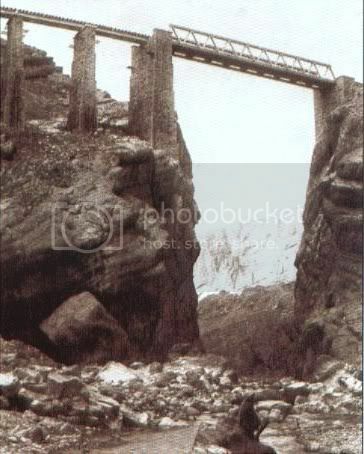 The icing on the cake in this project was the construction of a 225 ft high bridge. The design and calculations for this bridge were the most difficult for the period when it was constructed. The highest pier was 90 ft from top to bottom, and the weight of iron girders alone was 600 tons. The bridge consisted of seven 40 ft long and one 150 ft long girder span which was used over the deepest part of the rift. To build this bridge, the executive Engineer of the project named Captain scott, borrowed two similar spans which were built out as cantilevers from each side of the abyss. When this temporary span had met in the middle, Scott built his permanent span on top, afterward removing the false work. The whole work was completed without the loss of a single life. The bridge was opened by the Duchess of Connaught on 27th March, 1887 in the presence of Duke, Lord Roberts, and a distinguished company of people. The occasion was marked by the explosion of 20 mines. The bridge was named after the Duchess who praised it as the most glorious piece of work in the subcontinent. From that day on the bridge came to be known as the Louise Margaret Bridge. 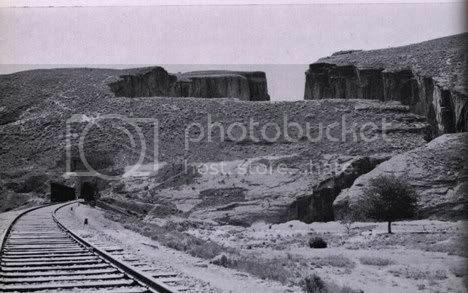 The Railway line served as an laternate route to Quetta for about 55 years. 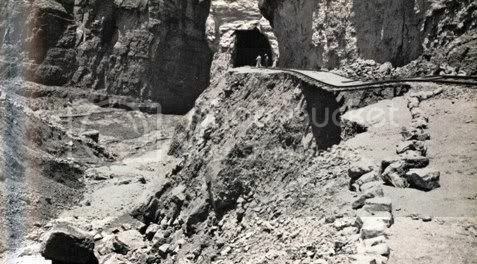 On the night of July 10, 1942 there was a flash flood in the area which swept away the scree bank in the Chappar Rift. 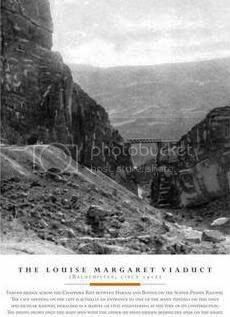 With the scree slope washed away there was nothing left for the railway to be laid upon. It is said that water level reached upto 30 ft in the mud-gorge area and it caused wide spread erosion of rail foundations. 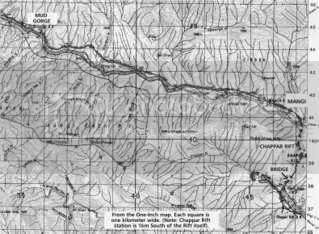 The railway route through Bolan Pass had stabilized over all these years in terms of weather as well as security. This left the importance of a longer rail route through Chappar Rift to non important issue. 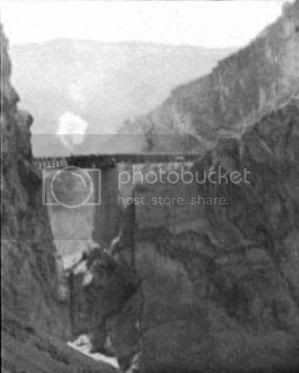 Therefore in 1943 it was decided that the railway line between Zardalu and Bostan which carried only one train a week, should be closed down. The decision was carried out in the same year and the track was finally uprooted. The photo to the left shows how in 1944 the Louise Margaret Bridge was being taken down after this section was closed down. 133 km of track between Sibi, Harnai and Khost was operational until early 2006. The track is operationally (but not officially) closed due to damaged bridges. There is a chance that Sibi-Khost route will become operational again. Where once I ruled the day. Till XAs made me shift. If someone wants to visit the area to explore the leftover remains of Chappar rift railway, there is now a gravel road that goes from Bostan to Harnai and passes through the Chappar Rift. A portion of this road is shown in the photo to the left. 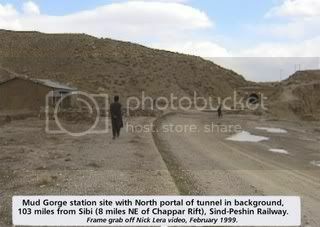 The photo also shows the north end of the mud gorge tunnel. Most of the time the road is nothing but the embankment of the old abandoned Chappar R ift broad gauge railway line. On the way the road goes through at least three railway tunnels. Then there is a Chai Khana (tea shop) in the middle of no-where. One can find stone boundry pillars engraved NWR (North Westen Railway), holding poles for the sunshade of this ramshackle tea shop. The piers of a number of bridges including the Margaret Louise Bridge are still there as also some tell tale signs of railway stations. The Nari river valley including the areas of Harnai, Khost and Spintangi produces a lot of fresh fruits & vegetables. These are transported by trucks to Quetta and other places over the Chappar Rift. People associated with this freight service form the customers of this out-of-no-where Chai Khana because there is hardly any local population around. In 1895 a delegation by the name of ‘World Transportation Commission’ visited different transport landmarks of India. The rail route via Chappar Rift was one of the landmarks visited by this delegation. Following photos were taken by the commission members. 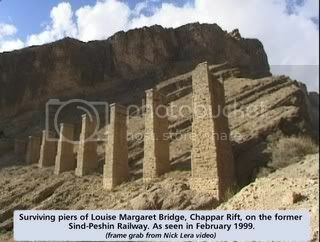 Following is a youtube clip found through web search that shows amazing photos of Chappar Rift from 2010. Mr. Nick Lera, for many of the photo of this article as well his email account of Chappar Rift travel. He also corrected some of the mistakes I had made in an earlier write-up of this article. Mr. J.F. Andrist for his email account of Chappar Rift travel. Mr. Jeff Bounds for his email account of Chappar Rift travel. 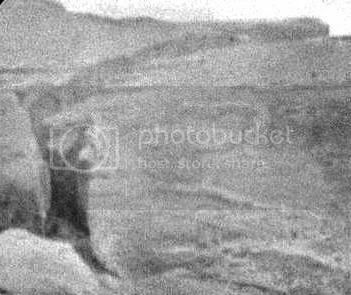 Chappar Rift Photo Album – A collection of photos that appear in this article. Image to the left is a poster depicting the photo of Margaret Louise Bridge in Chappar Rift. 1. Journeys to Remember: Quatta-Lahore by Rail in 1925. Good Research !!!….. From Where You Get This All Information About CHAPPAR Rift? ?